How do you solve a problem like Atwells? By now we all know we have a problem on Atwells Avenue. The main problem of course is, people keep getting hit by cars on the Avenue. There are perhaps two ways to stop this, enforcement and infrastructure. Infrastructure is unfortunately expensive, however, the enforcers cannot be everywhere all the time so let’s look at what infrastructure can do. The incidents have generally been taking place at the western end of the street. This is the end where the pedestrian activity and activity in general starts to diminish. It is also where the street gets wider and darker. Though the city speed limit is 25mph, as we’ve discussed before, traffic generally moves as fast as it can, and the western end of Atwells is engineered for faster moving traffic. When we look at this area we see that the street is wide, flat, and runs downhill. Combine that with less activity on the sidewalks and poor lighting and we have traffic moving too fast. While the city speed limit is indeed 25mph, cities around the world have been joining the 20’s plenty movement. Atwells is a densely packed residential area and one of the city’s most visited retail districts. 20mph should be the functional speed limit of the street. The first infrastructure intervention that could be implemented to reduce speeds is to reduce the lane width. See this image below of Atwells and Wickenden Streets at the same ratio. 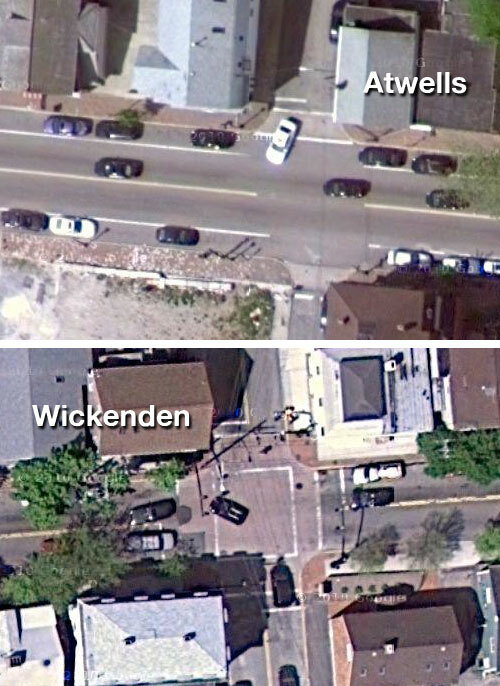 Anyone who has ever driven on both streets knows that Wickenden is much more narrow and that that forces you to drive slower. You can see in the image that three of Wickenden’s lanes would fit into Atwells two. Space taken away from the roadway can be transferred to the sidewalks, giving more space for pedestrians to pass by Atwells’ ubiquitous outdoor dining tables. Narrowing the street provides a benefit to the restauranteurs. Another infrastructural intervention that can help to slow traffic and also give an advantage to pedestrians is the pedestrian refuge or pedestrian island. It is also often used when no light exists, and pedestrians need safe harbor after managing one direction of traffic, before taking on the next. This significantly improves the amenity for pedestrians trying to cross busy streets, as they are much more likely to find two small gaps in traffic rather than one situation in which gaps for both directions coincide. Since this reduces their average waiting time, it also improves safety – with impatient pedestrians less likely to use gaps that turn out to be too short for safe crossing. The refuge need not be large or landscaped. Simply a small area of raised curb with signage making it clear to drivers. It is an obstruction in the road that drivers need to be alert to, forcing them to pay attention, and has the added benefit of allowing pedestrians to cross half the street then wait. Which moves them across often much quicker and much more safely. 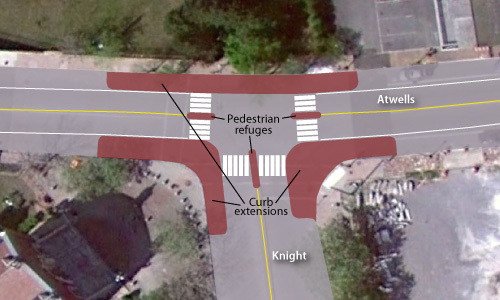 Pedestrian refuges could be installed at Bradford Street, Bond Street, Dean Street, between Acorn and America Streets, Sutton Street, Vinton Street, Piedmont Street, and Knight Street. Raised crosswalks are another way to calm traffic and give better visibility to pedestrians. Personally, I think raised crosswalks should be used sparingly. They tend to slow traffic down too much, almost to a stop, which tends to piss some drivers off, making them act out by speeding between them. Not the outcome we’re seeking. 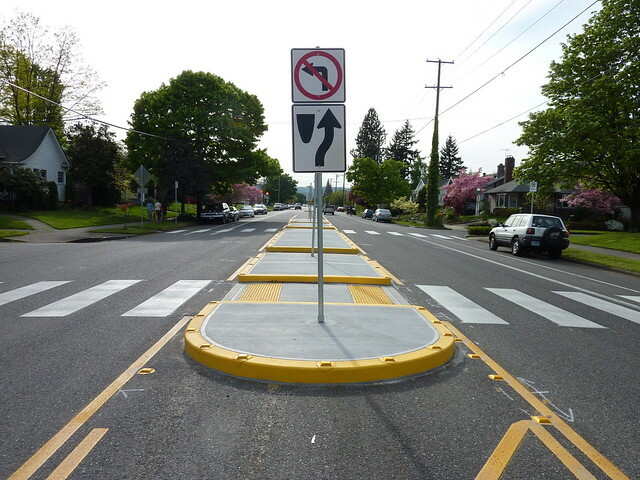 Curb extensions should be used at key intersections to reduce the width of the street that pedestrians have to cross and to physically prohibit vehicles from parking in crosswalks. At Acorn and America we start with curb extensions bringing the sidewalks out and narrowing Atwells. First note, we lose no on-street parking here as there is no parking allowed within 20 feet of the corner, this physical intervention ensures that cars cannot park too close to the corner eliminating the need to enforce this through police action. In fact, the western corner of America is pushed east actually creating new parking where it was prohibited before by the wide mouth of America Street. The gap to cross America Street is greatly shortened benefiting pedestrians, and making it so drivers need not wait for pedestrians to clear the wide gap. The curb extensions combined with a pedestrian refuge reduce the width of road that pedestrians need to cross on Atwells as well. Studies have shown that shortening the gap for pedestrians actually helps traffic flow as pedestrians clear the roadway faster allowing stopped traffic to resume sooner. Pedestrians are benefited by being able to cross half the street while it is clear then waiting on the pedestrian refuge for the other side to clear. The refuge also makes pedestrians visible to oncoming traffic in the far lane, increasing drivers ability to see pedestrians, and allowing them to stop, when otherwise they may not. The pedestrian refuge also prevents traffic coming from America heading to Acorn to cut the intersection. Traffic currently making this maneuver often cuts across diagonally, creating traffic flow from an odd direction that pedestrians are not expecting, endangering the pedestrian. The curb extensions also allow traffic waiting to exit Acorn and America to be able to see the traffic on Atwells. Currently, the stop lines are behind buildings and cars nosedive across the crosswalk in order to be able to see oncoming traffic. The extensions allow traffic to stack behind the crosswalk so that pedestrians are not forced to walk around waiting cars. Finally, the extensions give more room on the sidewalks for retailers. 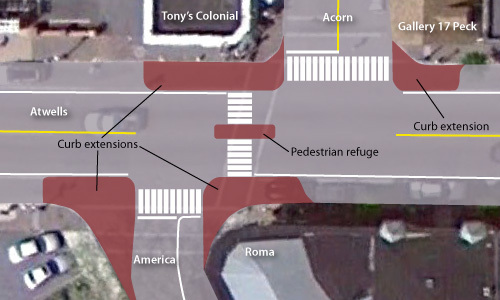 In this scheme Tony’s Colonial could easily place tables or retail bins on the sidewalk with plenty of room for pedestrians, wheelchairs, strollers, et. al. to pass-by. Curb extension in Portland, OR. Photo (cc) Jason McHuff. You can see here there is a channel to address drainage issues (that will be covered with a grate when complete). Sidewalk extensions can even be achieved simply with paint on the roadway and planters and bollards as the physical barrier. Similar treatments can continue westward down the Avenue at Sutton, Vinton, Piedmont, and Marcello. Treatments can vary or be phased in as funds come available. Raised crosswalks could slow traffic enough in some areas, full curb extensions and pedestrian refuges in others. Among people seeking solutions for this problem, traffic lights do come up. I think they are not the answer in all cases. One big problem, is it sets up a situation where divers are looking to one place for their cue, the light. If the light is green, foot hits accelerator. Removing traffic controls forces drivers to pay attention to everything, making more alert and safer drivers. One place where I think a light might be prudent is at Knight Street. You can see how much area was given to cars, which they don’t actually need in the red. The intersection is reduced from suburban highway to urban street dimensions. Room is given to pedestrians, the area pedestrians have to cross is reduced, and drivers are given physical cues, through the size and shape of the roadway, that this is a mixed area, they must slow down and pay attention. Of course the newly redesigned Atwells & Dean intersection is another place where physical interventions are needed to increase pedestrian safety, but that is likely a thousand word rant for another day. State Senator Jabour is hosting a meeting (could someone have a meeting that is not when everyone who lives up here is trying to be at work please?) with RIDOT and the Federal Hill Commerce Association on Tuesday morning to discuss the Avenue. While I’m happy to see the Senator taking action”¦ RIDOT? Sigh. I’m sorry, but they created this mess to begin with, and as much as I hope to see a change in attitude from that agency, recent actions do not leave me hopeful that they can design a road that is safe for pedestrians. We need to fix this. We can’t have pedestrians continue to be maimed and killed in on one of the city’s top tourist destinations. We have to do it right though. The curb extensions and refuge islands are great ideas. These are good alternatives since the fire department has protested attempts to install speed bumps on a main street like Atwells Avenue. One of the reasons that Atwells Avenue is such a speedy road is that the two travel lanes are about 14 feet wide each. A standard Interstate highway lane is 12 feet wide, which is designed for speeds in the 65 MPH range. So along with the curb extensions and the refuge islands, Atwells’ travel lanes should be put on a road diet to 10Ã‚Â½ or 11 feet wide. With reduced lane widths the parking spaces could be shifted away from the sidewalk allowing more room for pedestrians and sidewalk cafes. There are examples of this technique in Manhattan on Broadway near Union, Herald, and Times Squares where the curbs are not moved. Masonry planters or rock blocks are positioned to keep parked cars out of the new added pedestrian walkway. The added pedestrian walkway is painted with a sand mix to make it distinct from the asphalt so pedestrians understand that it’s for their use. Nice ideas but a simple mini-rotary at Atwells and Knight would slow traffic down easily. One could also use some of that reclaimed lane-width to add a bike lane. My thought on bikes is that, if we make the effective speed on the street be 20mph, bikes should be able to keep up and travel mixed with cars. Creating bike lanes on Atwells makes me worry about the door zone. Paint Sharrows down the middle of the lanes so bikes can ride in the lanes away from the door zone. Reclaimed space would be put to good use as bike parking though. I agree with Jef on the bike issue. Broadway is a much better street for bike lanes. While they’d be nice on Atwells as well, the amount of traffic and parallel parked cars, not to mention it’s more narrow than Broadway, makes it more dangerous. I like the idea of curb extensions. The 20 feet from a corner rule is not enforced on Atwells, making it nearly impossible for cars trying to pull out of the side streets (I used to live on Bond, a one way towards Atwells, and this was always a problem). The curb extensions would make it safer for those cars trying to pull out of the side streets as well as pedestrians crossing those side streets. While it will be more expensive, I’d like to see Atwells narrowed down to the same width the entire length of the street or at least until the Bridge over Rt 10. Narrowed to the width of Wickenden along that entire strip from the Service Road all the way to the Rt 10 bridge would be ideal, especially if the curb extensions were still added. Oh, you also noticed meetings happen long before anyone can be home from work? To improve pedestrian safety on Atwells Avenue on Federal Hill, the city intends to install more crosswalk signs, re-stripe crosswalks and install a “speed hump” in the vicinity of the spot where a City Council member was struck by a hit-and-run driver. These are “temporary” measures while longer term plans are created and implemented. RIFuture has a more extensive write-up about the meeting. ProJo: Pedestrian-safety measures planned for Providence’s Atwells Ave. I really like the ‘pedestrian refuge’ and really hate narrowing, adding stops, and bumpouts. I can’t ride my bike anymore (neck injury), but I was a rider when they added the bumpouts on Hope Street, and I can say with some certainty that they don’t really slow cars down, but do force bikers into traffic. I’m a big fan of adding a few stop lights (with crosswalks) that are -synchronized- to allow non-stop passage at 25 (or 20) miles per hour. Unfortunately, Providence DPW has shown that they are completely incapable of maintaining sychronized traffic lights. It’s like they don’t have a mathematical model to work on, they just get up there and set the light to switch every 30 seconds. The bump outs I propose would not narrow the travel lanes any more than they are narrowed by parking. The bump outs would sit where parked cars do on other parts. The bump outs are not so much to calm traffic as to physically prevent cars from parking in the intersection. Giving cars moving into Atwells from the side street better visibility, and reducing the space pedestrians have to cross. Rather than coming from behind parked cars, pedestrians would be able to wait at the edge of the travel lane. With a reduced effective speed of 20-25 mph, bikes should be able to (rightfully) take the entire travel lane and move with the auto traffic. Slowing the traffic allows bikes to take the lane and not be relegated to the door zone. Also, the bump outs would be an ideal place to install much needed bike parking. Of course, we need driver education so that drivers are aware that bikers have a right to the lane. Share the lane signage and sharrows should be installed. I think that Hope St. would have been nicely served by a bike lane like this one in Montreal: http://tinyurl.com/3xrco98 . The vehicular lanes could still be narrowed, but by giving space over to bikes instead of taking it away. The same idea could maybe work on Atwells but the busier section might be too narrow for a lane in each direction (not gonna touch dropping a parking lane). It’s also trickier because if the bike lanes are flowing freely when the traffic gets backed up, I foresee a higher risk for ped vs. bike conflicts. Broadway is a better street for bike lanes but it’s not a reasonable route for destinations off Atwells towards the west. Jef, you might be right that mixed-use is the only way for the eastern end of Atwells, but I think that the western side near the highway and over the bridge could accommodate a nice wide, physically separated bike lane to narrow the traffic lanes. I have a theory that Atwells, along with upper North Main Street, Smith Street, Douglas Ave, Chalkstone, and Elmwood are all high speed zones because they’re still considered highways. In the 18th and 19th century this must’ve made sense because there wasn’t much beyond the East Side and Downtown besides maybe a few neighborhoods of farms and grist mills. But today, post-highway expansion act, the rise of car ownership, they’ve dense neighborhoods. I think they need to be changed from double yellow lined roads to dotted white stripped ones to decrease the speed. In addition to making it an overall friendly place to walk. They should turn at least one of those shoulders into a bike lane! I think rather than narrowing the road it should be re-purposed somehow. ProJo today has this article about the problem of newer unruly nightclubs on the Hill. Let me just take a tagent and vent about the new unruly nightclubs on the Hill, then I’ll highlight some of the infrastructure things that came up in this article. I’ve lived on the Hill, in the same place off Atwells since 2003. The late night activity and the annoyance of the late night activity has ebbed and flowed over those years. Perhaps I am getting older and less tolerant, but the Avenue has not been as bad as it is now in any of those years. Between 1am and 2am there is a steady stream of horrific young, let’s call them women (though they are mostly orange so I am not sure what they are), yelling and screaming and having physical altercations with each other and with defenseless men. Then the young men fight with each other because these women have started a whole to do about nothing (which young women seem to be particularly good at). Then there are all the slightly older men with the small penises and loud motorcycles. Then the peeing, and the trash, and the puke. Oh, and the rat situation, which was mostly under control, has exploded again. [Chairman of the city Board of Licenses Andrew] Annaldo urged the 16 licensees to better manage the people leaving cars with valets and queuing up on the sidewalk to enter their establishments, to better control noise and to enforce a dress code for patrons. Some nightspots are putting more tables out on the sidewalk than their permits allow, he alleged. I wonder, how many businesses even have permits to have tables on the sidewalks, and if anyone ever inspects those tables. I would guess very few have permits, and no one inspects. When the tables are empty, the sidewalks are impassable, when people are sitting at them, forget about it. City Councilman Bryan Principe, whose ward includes the Hill, insisted that the businesses accommodate pedestrians because, he said, it is dangerous if people are forced to walk in the street. A study has shown that Atwells is perilous for pedestrians, and the city is planning safety improvements in addition to some that were made recently. I’m all the time in the street when I have to walk to Walgreens or something. Of course, many of the physical interventions I’ve suggested to narrow the street would allow for proper clearance for tables and pedestrians. With Annaldo’s urging, meeting participants suggested ways to better cope with the pedestrian and traffic congestion on weekend nights. Making traffic on Atwells temporarily one-way or temporarily closing the avenue to traffic are two ideas that will be seriously considered, he said. Temporary one way would be a nightmare, because most certainly they’d make it two lanes one way, and that would just speed traffic. Closing it entirely… It is not a terrible excercise to consider that, and buy entirely, I’m thinking forever. It really would make a terrific pedestrian zone, at least from Dean to say America. When two or three proprietors took the opportunity at the meeting to suggest that the city allow them to stay open later because it would give them greater flexibility to manage their premises, Annaldo said no. This is me certainly getting old. I’d be at any hearing or meeting on this issue waving my cane and saying hell no. I’d probably also make a poorly spelled sign and start a Facebook Group and send indignant emails to everyone in my address book. Here’s an idea, hire enough staff to manage your premises, if you can’t afford that, then your business plan has failed. Question… what makes you think that the establishments on the Hill wouldn’t decide that wide sidewalks means more tables for them? There are certain restaurants *coughMediterraneocough* that already look at the sidewalk as an extension of their dining room rather than a place for people to walk (I pick on Mediterraneo, but they’re hardly the only offenders… Siena, Blue Grotto, and whatever was next to Siena but closed are also all nearly just as bad, but only had 1 layer of tables against the building). What the city really needs to do is actually enforce the laws on the books. Have random inspections to make sure the restaurants and clubs that have tables on the sidewalks have permits. And make sure they only have as many tables as they are permitted. If there is a violation, fine the restaurant. If there is a second violation, they lose the permit. If they never had a permit to begin with, they are banned from getting one the following year. If they continue, they should risk losing some other permit… like let’s say their liquor license… something that will really hit them where it counts. I can’t blame the restaurants for wanting to make as much money as possible. I can blame them for violating the laws the city has on the books. But I can also blame the city for not enforcing the laws on the books. It’s the same thing as the snow removal and parking laws. The laws exist. The enforcement does not. Annie, start with your city councilman. Organize a community meeting. I frequently use Harold St because it’s more direct than taking River Ave (same reason others use it… also cuts out the lights at River and Valley and River and Chalkstone). I will say that a lot of the offenders are people who actually live on or are visiting Harold Street. The police used to hang out at the stop sign at Harold and Berkeley, but I haven’t seen them there in years. If you complain to the police about people speeding or running the stop signs (and they do run those stop signs frequently), they might put a car there to look for violators.